We summarize our methodology in five phases. From Abantail we can manage all phases of the project cycle, offering turnkey projects. 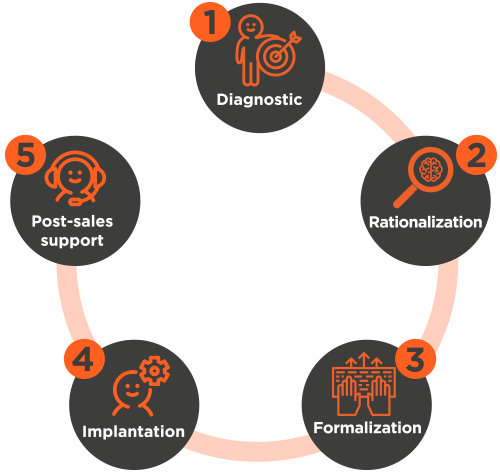 The PRODUCT-PROCESS DIAGNOSTIC consists on the analysis of the existing products, systems and tools in the company: rules, norms, possibility of standardizing, etc. Before implementing a configurator, we analyze and value the profitability that your company can obtain. The PRODUCT-PROCESS RATIONALIZATION, consists on the exhaustive analysis and extraction of the existing product knowledge in the company. We will analyze the history of the company to extract standards, regulations, restrictions, etc., in order to define reusable technical solutions in the automatic generation of new product variants. The PRODUCT-PROCESS FORMALIZATION is the introduction of all the above in the configurator. To formalize is to express product variability based on structures, conditions, restrictions, rules, standards (DIN, ISO, UNE, own to the company), calculations, checks, parameters, etc. IMPLEMENTATION OF THE TOOL, as well as the necessary interfaces for collaboration with the other company’s systems. The Abantail TRAINING SERVICES allow our clients to be autonomous in the use of the implemented tools, allowing them to incorporate new products, modifications and apply changes for CONTINUOUS IMPROVEMENT within the implanted system. From Abantail, we offer a complete series of post-sales services to ensure the SUCCESS OF OUR CLIENTS, thus ensuring the natural growth of the configurators and helping our clients to adapt to the continuous market changes. Our specialized technical team will solve all doubts, clarifications or incidents that arise in the operation of the configurator through remote or in-situ assistance.